Many alcohol based cleaners contain fragrances or oils. These are contaminants, which have no place being anywhere near your valuable records. 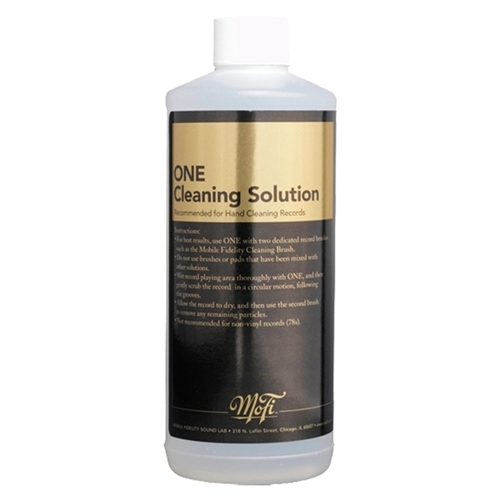 During the cleaning process, these contaminants will remain behind, on the surface of the record as a film, and in the grooves, attracting particles and affecting the sonic signature.MoFi ONE contains no fragrances, no oils, no contaminants. The lab grade alcohol used in MoFi One is an order of magnitude purer than what’s available at your corner drug store and is filtered for particulates down to 4 microns! Try MoFi ONE today and hear how it removes the veil between you and your music.